The phenomenon as muse: On being open to "friendly invasion"
According to Greek Mythology, the Muses were the nine goddesses who inspired artists and writers. As qualitative researchers we are inspired, shaken, and moved by the phenomena that we study. They are our companions on our journeys of exploration, binding us to our research participants who contribute to our understanding in sharing their stories with us and revealing something of their lives. The Greeks knew that they did not have mastery of the Muses; similarly, the phenomena we study are not in our grasp. However, as children of this age, enchanted with technology and its promise of control, we are apt to delude ourselves into thinking that with sufficient effort mastery might be within our reach. In exploring this notion of the phenomenon as Muse, I turn to the accounts of researchers, both my own and those of colleagues. I aim to give words to the evolving and often difficult dialogue with our topics, that is present in a powerful and yet typically tacit way as we undertake our task. This dialogue touches us intimately as we reflect on the dimensions of human life that capture our attention and lead us to places that we could not have imagined. As this process unfolds, questions arise and remain. For example, we wonder what openness really means and what role methods play in our work. Thus, although we may think we are done with our Muse when our project is completed, much of the time she is not done with us. As qualitative researchers, we have good reasons to enter into dialogue with poets. The theme of Muse and inspiration is central to their vocation and to ours. Poets struggle, as do we, to find ways to express the wonder, tragedy, and joy of everyday life. Admittedly, our precise tasks differ. We search for words that do justice to the stories of research participants and the meaning these stories hold; poets search for metaphors and images that are evocative of the landscapes they want to bring to life. Yet there is much overlap, for we too are in the business of finding metaphors and images that evoke experience. Two qualitative researchers in particular have focused on the use of poetic language in expressing more evocatively and powerfully the nature of phenomena. In one study, Todres and Galvin (2008) drew upon their own bodily and affective sense of their research participants' stories of living with a partner who is developing Alzheimer's disease to provide what they call an 'embodied interpretation' of this experience. More recently, they explored the use of what they describe as a kindling poetry writing process (Galvin & Todres, 2012) to allow an audience to write a poem, as a group, in response to a specific incident. The idea of the Muses came from Greek mythology where it referred to the nine daughters of Zeus and Mnemosyne. Mnemosyne was the goddess of memory and her daughters, the Muses, were beautiful young women who inspired artists of various types. More generally, a muse is "a woman or a force, who is the source of inspiration for a creative artist" (Muse, 2010, para. 1). The metaphor of the muse is a way of expressing the reality that creativity is not simply a matter of will and discipline but requires receptivity and openness. One of the issues that poets, as well as researchers, contend with and are conflicted about is the movement toward specialization within their discipline. Critics of specialization within poetry argue that this movement involves undue preoccupation with the crafting of words, the poet as a special kind of person, the world of poetry as a world unto itself, and, consequently, the separation of poets and their audience (see, for example, Berry, 1979). One of these critics is Wendell Berry (1979), a well-known American poet and writer who is also engaged in social activism on behalf of the preservation of family farms and sustainable use of land. As an alternative to specialization, Berry (1979) has argued in favour of what we might call a 'phenomenological' vision for poetry. He wrote: "For one thing the subject of poetry is not words; it is the world which poets have in common with other people" (Berry, 1979, p. 144). We see in this vision that community and communion are foundational for poetry, and we should consider whether this might not also be the case for researchers. In any case, this issue of specialization and the extent to which theory and jargon get in the way of our efforts to illuminate experience has also been an ongoing quandary for qualitative researchers. There is a risk of becoming unduly preoccupied with words, and yet how we use language is important whether we are poets or researchers. Finn Hansen (2012) has expressed concern regarding the way in which the abstract language of philosophers detracts from a genuine openness to and encounter with the phenomena under investigation. I believe that the specialized language of human science researchers, including our use of the language of philosophers, however notable and inspired, often gets in the way of expressing our insights into human existence. Our debt to philosophy is beyond dispute but using the same quotes from philosophers repeatedly can rob these passages of their power. With respect to language, it is evident, sometimes painfully so, that we rarely get close to the level of eloquence or power of the best of poets. Yet we can justly take pleasure and even pride in our vocation as researchers. Our disciplined and in-depth engagement with the life world through research provides us with the resources for engaging with poetry, allowing us to breathe new life into poems as well as into our own practice. This statement resonates with my own vision of what qualitative research looks like at its best and, I believe, it is meaningful for many qualitative researchers. Christian Wiman (2013) started writing his book after he was diagnosed with a potentially fatal form of cancer; this information provides the context for understanding the phrase, "These days I am impatient" (p. 46). Wiman's (2013) statement fits particularly well with a great deal of the qualitative research done within nursing and caring science. In such research, one often gets the clear sense that the researchers have been deeply engaged by the world and other lives. Ironically, the way in which they have been "marred and transfigured by the world" (p. 46) is most typically implied rather than told directly. The story of the researchers' relationship with their Muses is the intriguing dimension that is not often found on the printed page. The notion of muse may seem far removed from the world of qualitative research. Even if we put aside Greek mythology, and just think of the definition I mentioned before, that is, a Muse as "a woman or a force who is the source of inspiration for a creative artist" (Muse, 2010, para. 1) we still do not get very far. However, Kathleen Raine (1982), an English poet, elaborated on this definition in a way that connects it with our work as researchers: "The poet's 'muse' is more than a literary convention: it is the experience of every creative person that inspiration comes from beyond our own knowledge" (p. 34). The question then becomes: How does one trace and make more concrete that connection? The answer is relatively simple and is well articulated by another poet, Robyn Rowland (2008), who suggested, "Where to better to find our muse, our personal voice, than in the lived lives we have?" Researchers are not poets (although some of us may wish that we were) but we too should look to our lived lives as scholars to explore and understand how our muses have drawn us in and shaped our work. To find our muses we need to look at what has come our way, that is, the phenomena that have captured our attention, animated our professional lives, and, in some cases, become life-long companions or even obsessions. This article addresses the questions of where and how we can begin to describe our relationship to the phenomena that we study, that is, to our muses. First, I would suggest that, by and large, we have not given enough attention to this relationship. Other dimensions of our work as researchers, most notably our theory and method, receive more than their fair share of attention. However, in many presentations and publications, the discussion of the experience under study is relegated to the very end of our remarks, perhaps even being treated as if it were an afterthought, a minor character, rather than the protagonist of the play. In what follows, taking direction from Robyn Rowland, I turn to examples of the dynamics of researchers' relationships to their muses. Before taking up the first of three examples, I want to set the stage by affirming the importance of scientists' and researchers' personal engagement with and passion about what they are exploring. In his book, Is Nature Enough? 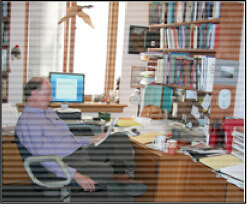 Meaning and Truth in the Age of Science, John Haught (2006) challenged the stereotype of the disinterested scientist. He wrote: "The assumption that knowledge is most realistic when it is impersonal actually amounts to a smothering rather than a purifying of the desire to know" (Haught, 2006, p. 45). Since Haught is a theologian involved with science but not a scientist, one might be skeptical about the validity of this statement, especially as it pertains to practitioners in the natural sciences. However, I was disabused of such skepticism when Haught's book was mentioned during a discussion at Seattle University with colleagues in the natural sciences. To my surprise, they readily agreed with Haught, expressing their own frustration with the stereotype of the scientist as the unemotional and disinterested observer. One of the physicists referred us to an article by William McComas (1996), a professor of science education. In his article, entitled the 'Ten myths of Science', McComas (1996) examined the way in which science textbooks misrepresent the scientific enterprise. One of the myths that he identified is the idea that science is more procedural than creative. In reality, he argued, creativity and intuition are at the very heart of the scientific endeavor. This discussion about scientists and their relationship to their subject matter may seem to be out of place in this article. As human science researchers, based both on reflections on our own experience and on the kind of theory that grounds our endeavours, we are apt to be in agreement with Haught's position. Yet the interrelated questions of the meaning of objectivity and the researchers' relationships to their fields of investigation in the natural and social sciences are not questions that can readily be answered in any definitive way. These questions continue to haunt us as we reflect on our activity as researchers and rightly so; they deserve to be revisited and examined since they stand at the heart of our endeavours. In the section below, three examples of researchers' engagement with a phenomenon are provided. Essentially, the children became Coenen's muses, drawing him into their pattern of interacting and communicating, thus welcoming him and at the same time giving him an experiential sense of their world. The second example comes from a study on the experience of hopelessness that my colleagues and I undertook about a decade ago (Beck et al., 2003). The six of us followed the dialogal phenomenological approach where we started out by writing down and discussing our own experience of hopelessness, and we used this as the basis on which to develop the interview question(s) that we used with our research participants. This approach requires a focused and ongoing dialogue among the researchers and between the researchers and the phenomenon under study. There is a disciplined and collaborative focus on the various descriptions, from both the researchers and the research participants such that the phenomenon, as it were, comes to be a presence in the room and a partner in the dialogue (Halling & Leifer, 1991). There is, in other words, an explicit recognition of the interdependence of researchers and phenomenon. This tradition of dialogue has a relatively long history. Jan Rowe, my fellow faculty member and I had discovered and developed the dialogal approach in the process of studying the phenomenon of forgiving another back in the mid-1980s (Rowe et al, 1989). We found at that time and with subsequent projects on other topics that it was a viable and effective way of working together in a group (Halling, Leifer, & Rowe, 2006). However, on this occasion, it seemed as if our faith was misplaced. Apparently, the phenomenon of despair had the power to overwhelm as well as to elude us, leaving us speechless and dispirited. The movie version of J. R. R. Tolkien's Lord of the Rings (Jackson, Osborne, Walsh, Ordesky, & Sanders, 2001; Jackson, Osborne, Walsh, & Ordesky, 2002; Jackson, Osborne, Walsh, & Ordesky, 2003) had come out around this time and we often, half-jokingly, compared ourselves to Frodo and his fellow hobbits who were engaged in a seemingly futile quest to defeat the evil Lord of Mordor. We did find comfort in working as a team and were certainly sustained by our trust in and care for each other, reminding us how much interdependence is at the core of this kind of group work. Yet for weeks it seemed as if we were making no progress whatsoever. Then during one of our meetings, it suddenly dawned on us that we were indeed being guided by the phenomenon in which were immersed. This meant that our distress was not, as we thought, a sign that the research project was failing. "Indeed, it was when we had the strongest sense of being lost, of being groundless, that we came to realize that our process was revealing to us the very essence of hopelessness" (Beck et al., 2003, p. 343). This realization gave us the momentum to move forward and to write about how the experience of hopelessness can best be communicated through the use of metaphors. These metaphors included being lost in the wilderness or caught in a swamp. The Mousai website states that Muses were portrayed in Greek culture as inspiring, gentle, and beautiful young women who led people from their sorrows [www.theoi.com/Ouranios/Mousai.html]. Just as this despair study shows, and as we as researchers already know from our own experience, the phenomena that capture our attention may well be anything but gentle and may create, rather than reduce, distress. However, my third example fits the benign image of the Greek Muse rather well. In addition, it comes from a recent study that provided me with the source for both the theme and title of this article. The initial focus of the third research example was intimacy in relationships. This research study once again made use of a dialogal approach and was also carried out at Seattle University. Over time, this project developed into a study of what we came to call the "experience of being deeply connected to another person" (Guts, Halling, Pierce, Romatz, & Schulz, forthcoming). In the hopelessness study mentioned above, the topic was daunting but we were able to persist and remain open because we had a cohesive group of researchers working on a clearly defined focus. However, from the very outset the intimacy study seemed as if it would not succeed and there were numerous times when our meetings were painful. There was a great deal of conflict among the group members, arising in part from divergent expectations as to what the study would involve. Intimacy, it soon became clear, was a highly ambiguous and emotionally laden topic, associated with our own deepest personal hopes and fears. The distress and ongoing disagreements were so powerful during the first five months of this project, that I (and the other members of the group) wondered what on earth we had gotten ourselves into. Fortunately, after much turmoil over a period of five months, we finally found our way forward. One of our members suggested we ask our research participants about a time when they found themselves deeply connected to another person. We did a pilot study on the use of this question and it worked very well. Because three of the research group members were recent graduates of our MA program and thus new to qualitative research, my colleague Jennifer Schulz and I decided to do a demonstration interview for them before we started the formal interview phase of the study. It was at that point that something truly remarkable and entirely unexpected happened. We went to a very expensive restaurant where they had individual purse stands at our table and we had three different servers attending to us but almost immediately, everything (purse stands, wine sommelier, other diners) faded away. It was just us, totally swept up in our conversation and our delight in being together, and it felt as though everyone in the restaurant was honoring us in this joyful experience of reconnecting (Guts et al., forthcoming). This experience of deep connection brought all of us together as we were completely entranced by and caught up in the story .We felt powerful warmth enter the room and it was at this point that the phenomenon became strikingly present among us. As we talked about this experience after the fact, we described this event as having a "kind of transcendent quality - a feeling of shared humanity and connection to the world - that resonated beyond the meeting and that we carried out into our lives in subsequent days" (Guts et al., forthcoming). Our muse appeared in an unforgettable and healing way. On being open to "friendly invasion"
Having presented these brief pictures of aspects of researchers' experiences, I want to turn to the insights of a prophetic cultural critic. By prophetic I do not mean that the person actually predicted the future but that he discerned, before the vast majority of his contemporaries, troubling patterns and values that were becoming increasingly influential in American culture and society. I am referring to a writer who today is virtually unheard of and whom I know about only through the good graces of one of my colleagues who teaches English literature. This writer is Walter Kerr, drama critic at the New York Herald Tribune, who published a book entitled The Decline of Pleasure in 1962. By the decline of pleasure, Kerr (1962) was referring to the effect of utilitarianism becoming a pervasive and operative philosophy in the United States. In relation to utilitarianism, Kerr (1962) was referring to the philosophy of British thinkers such as Jeremy Bentham (1748-1832). Bentham's philosophy was summarized by the economist Williams Jevons, whether justly or not, in the slogan 'Value depends entirely upon utility'. Given the already existing pragmatism of American society, this form of utilitarianism was easily absorbed into the collective psyche. Kerr (1962) aptly summed up what this philosophy means in practice: "We do not mean to work for a while and then to play for a while. We do mean to work all of the time and let play come to us in passing, like a sandwich that is brought to the desk" (p. 128). Play, recreation, and contemplation get shuffled to the side, and become 'guilty pleasures'. This attitude continues to be alive and well, and not just in North America. I am reminded of how entrenched this preoccupation with work is among our students each year when I teach an undergraduate seminar on phenomenological psychology. They are given a relatively simple assignment of spending three periods of about 45 minutes sitting in silence, and then to write a description of their experience. Most of the students find this exercise difficult, if not excruciating. Typically, they report that their minds are racing and they are anxiously preoccupied with all the things they should be doing. They feel uneasy or even guilty about just sitting and doing 'nothing', and also wonder if they are doing this exercise the 'right' way. The kind of receptivity and openness that is referenced by "laying ourselves open to friendly invasion" (Kerr, 1962, p. 220) is exemplified in the descriptions of the three research projects I have just presented, as well as in thousands of other instances, in and outside of research, in relationships as well as in the creative arts. At a personal level, we know about this realm of experiencing. Yet I would argue that in the context of our research we do not value it enough, or perhaps we do not acknowledge it sufficiently. This mode of receptivity stands in stark contrast to what Wendell Berry (1979) identified as one of the primary characteristics of specialization, namely the "singular totalitarian ideal of control, which is typically achieved by leaving out or discounting or destroying whatever is not subject to control" (p. 141). In this statement, Kolodny (2000) picks up on some of the issues present in the three research projects I have referred to previously: the uncertainty, the sense of being lost, and the challenge of allowing oneself to remain open when the territory ahead appears foreboding or indescribable. Let me now turn to a different aspect of the research process, one that is more familiar and likely more comfortable to us as professionals. So far, it might seem as if I am arguing for a Dionysian vision of the research process. Dionysus was the Greek god of wine making and ecstasy, and I have been emphasizing creativity, giving oneself over to one's muse, and the importance of epiphanies. However, this is not quite true; I have tried to attend to the lived lives of researchers, and as researchers we are keenly aware that much of the research process is anything but Dionysian. To explore research from a different but complementary angle, I turn to a Middle Eastern maxim that is almost universally known: "So by their fruits you will know them." This quote comes from the Gospel according to Matthew, in the New Testament (7:20, New American Bible, Revised Edition). In this section of the gospel, Jesus is speaking to his disciples, and reminding them that just as you can tell a tree by its fruit (for example, figs come from fig trees and not thistles) so you can tell the difference between true and false religious teachers by their actions. In our everyday lives and in our professional activities we follow this maxim, although perhaps not as much as we should. In any case, if research produces informative, illuminating, or even enlightening results we really pay attention and wonder how these insights came into existence. In other words, we ask what enabled the researchers to come up with these results; we ask what about their background, habits, and methods enabled them to be successful, and we ask what allowed for these understandings to emerge. To develop this theme, I present an anecdote from my own teaching experience, starting from the end of the story and working backwards. For some years I have taught an undergraduate course on qualitative research. The students work with descriptions that I provide, and there is one description in particular that has been especially effective in terms of the goals of the class (based on Halling, 2010). The story comes from an interview with a young woman who has experienced religious disillusionment (Holtz, 1984). She describes being raised in a Catholic household and taking her faith very much to heart. When her fiancée applies to medical school, she continually and steadfastly prays that he will be admitted. Of course, she is shocked and dismayed when he is denied admission. Typically, the students who read this description are perplexed by her reaction and make various critical judgments about her, commenting on her naiveté and immaturity. 'Bracketing' judgments as well as preconceptions is a principle that they might subscribe to in theory but, like the rest of us, it is one they find difficult to implement in practice. Some of the students, the ones that are persistent and receptive, eventually come to a kind of epiphany as they start to realize that they have been evaluating this young woman's experience from their own point of reference instead of being open to her perspective and life context. Sooner or later, a student says something like: "Ah, now I get why she was upset that her boyfriend did not get into medical school when she had prayed so hard that he would be admitted. This showed her that the God she had so firmly believed in, a God who can be relied on to answer prayers of the faithful, did not exist." There is two-fold recognition, at least for some of the students: first, this is what is going on for this woman; and, second, that in order to see her point of view, one must first recognize and move past one's own egocentric perspective. The question is how they arrive at this new understanding. When I teach this class, I divide the students into small groups of four or five based on particular topics that they want to explore. During our time together, the students spend a considerable amount of time becoming familiar with and using the descriptive phenomenological method developed by Amedeo Giorgi (e.g., Giorgi & Giorgi, 2003). They go through the process of breaking the description into meaning units, summarizing the psychological meaning of each unit, and so on. It is as they work with the story in this structured way, that some of them find a way into the lived experience of this young woman. I now provide a further example along the same lines. For the last two years I have been working with Matthew Stichman, one of our graduate students at Seattle University who is doing his MA thesis on the experience of working as a service provider in a harm reduction substance abuse treatment center. Previously an addict himself, he found his way to recovery through abstinence-based treatment, which in turn is within the Alcoholic Anonymous tradition. He also has years of experience as an addiction treatment provider. The task of understanding the harm reduction approach (which does not require abstinence) has been very challenging for Matthew. He has been using Interpretative Phenomenological Analysis (Smith, Flowers, & Larkin, 2009) as his approach to reading and analyzing the interview data. Through this process, which is extensive and exhausting given the amount of material he has gathered, he has gradually come to understand much more of what his research participants were saying during the interviews and to recognize the way in which his own beliefs and history stood in the way of such an understanding. Much has been written and will still be written about the relative merits and limitations of the multiple methods that exist within the human science tradition. In the discussion of the above two examples, I have focused on the way in which methods, notwithstanding their differences, enable us to move forward. This is equally true for the three studies I described previously. Coenen (1986) was trained in phenomenology, grounded theory and participant observer approaches. Writing his field notes, which provided the basis for his understanding of how he was drawn in by the children he studied, was a laborious and painstaking process. The two dialogal studies involved writing descriptions, carrying out interviews, and then reading and re-reading all of the material and discussing it almost endlessly, for about a year, in each case. As dialogal researchers, we found it essential to rely on particular methods specific to the human sciences in carrying out these projects. For instance, there certainly is a science and an art to developing interview questions and carrying out an interview (e.g., Kvale & Brinkman, 2009). However, we also found it to be true, as Gadamer (1960/2004) has said, that the experience of true conversation is transformative: "to reach an understanding in a dialogue is not merely a matter of putting oneself forward and successfully asserting one's own point of view, but being transformed into a communion in which we do not remain what we were" (p. 371). Two Americans were taking the bus in a German city. One spoke German and the other did not. In front of them sat a young German couple, having an animated and lengthy conversation. The one American turned to his bilingual colleague and asked, "What are they talking about?" He replied, "You have to wait a minute. They haven't gotten to the verb yet." The phenomenon, like the verb in the German sentence, is what brings everything together at the end. It is what we anticipate and we are given intimations of at the beginning of an article or a presentation. Ideally, it erupts or unfolds for the reader or audience but for the researcher it has been a companion or guide from the very beginning, however anomalous or ambiguous its character. Phenomena and researchers are intimately connected or interdependent and often in ways that are not fully seen or acknowledged. I am not suggesting that interdependence is the only way to describe our relationship to the topics we study, but I want to emphasize that it is a critical dimension of that relationship. Finally, I would argue that this interdependence, far from being a problem, is instead a cause for recollection and appreciation. We all belong to where everything sooner or later is part of everything else which thought made me feel for a little while quite beautiful myself. I am grateful to Christie Lynk, Jennifer Schulz, and Mical Sikkema for their encouragement and suggestions. This article is based on a keynote address given at the International Human Science Research Conference, University of Aalborg, Denmark, August 2013. The Mary Oliver (2012) poem reproduced above was included with the permission of Penguin Press. Professor Steen Halling is a licensed psychologist and Professor at Seattle University, Seattle, USA, where he teaches in the MA programme in existential-phenomenological psychology as well as in the undergraduate programme. He is editor of the International Human Science Research Conference Newsletter and co-editor, with Ronald S. Valle, of Existential-Phenomenological Perspectives in Psychology (1989; published by Plenum, New York). Steen is also the author of Intimacy, Transcendence and Psychology: Closeness and Openness in Everyday Life (2008; published by Palgrave Macmillan).